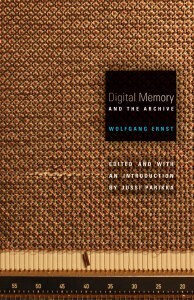 We should understand the title of Wolfgang Ernst’s collection of essays, Digital Memory and the Archive, as the literal subject of analysis. That is, Ernst regards computers (and analog devices such as the phonograph) as agents that independently produce modes of scientific knowledge and cultural tradition. As a discipline, media studies ought not commence analysis with the content of mass media nor the historically contingent, culturally specific uses of communication systems. Rather, media studies should more properly critique media machines as agents of science working to inscribe or register physical realities through their “ahistorical” (170) being in the world, operating outside discourse and subject to their own technologically specific temporalities. As this general summary makes patently obvious, Ernst’s theoretical positions are controversial, if not downright polemical. At least it reads so to me, although that might be a result of my training in the Anglo-American approach to media and cultural studies. Indeed, in the introduction to this volume, Jussi Parikka addresses the oft-cited difference between Anglo-American and German approaches to media. Even though “there is no such thing as German media theory”(19), Parikka posits the work of Friedrich Kittler as a point of reference for much of German media studies’ research agenda. Parikka characterizes the “Kittler effect” as “fostering a whole debate on media materialism and technodeterminism” (3). Like Kittler, Ernst is concerned with hardware and views Anglo-American media studies as “associated with the cultural studies style of critique”, an approach that “presupposes a primordial binding of media to the social and cultural spaces they occupy” (25). Ernst’s goal, however, is not to denigrate culturally oriented analyses of media, but to offer technologically specific accounts of media machines that might serve as a “transatlantic bridge” (23-36). Through his unique brand of media archaeology, Ernst seeks to reveal the “technicality of media, not to reduce culture to technology but to reveal the technoepistemological momentum of culture itself” (72-73). Media archaeology is, of course, the conceptual thread uniting this collection. Almost every essay takes time to define or describe media archaeology in various ways. Indebted to Foucault’s Archaeology of Knowledge, Ernst writes that “media archaeology makes us aware of discontinuities in media cultures as opposed to the reconciling narratives of cultural history” (25). Media archaeology is technical, seeking to understand the signal processing of machines. It is therefore “close to mathematics” (72), more concerned with counting than telling (147-157), “both a self-reflexive method and an archival object of research” (41). His method, however, is not intended merely to understand engineering principles of media machines. In a rare exhortation, Ernst writes, “Let us employ media archaeology to suspend our subject-centered interpretations for a moment, while at the same time admitting that this technoascetic approach is just another method we can use to get closer to what we love in culture” (72). Put differently, media archaeology facilitates a perspective that sees media as assemblages of “nonlinguistic agencies” (42), themselves able to register physical phenomena (e.g. electromagnetic waves) within scientific regimes of temporality apart from cultural systems of signification (e.g. language as discourse). Ernst proposes that through the interrogation of these conflicting regimes, “Media archaeological analysis will be rewarded by the sweetness of the human voice” (73). But still, how is it that Ernst can advocate such a seemingly contradictory approach, one that takes Foucault’s notion of archaeology and applies it outside of discourse? The ontological specificity of various media machines functions as the a priori of Ernst’s theoretical stance. Indeed, Ernst understands the term “media archaeology” not “as referring to the ‘digging out’ of forgotten machinic visions of the past” (55), but rather as a way to access “the technological ‘beginnings’ (archai) of operativity on the microtechnological level” (57). By emphasizing the “archae” of archaeology, Ernst seeks the very a priori of media operation, going so far as to cite “Immanuel Kant’s words, the condition for the possibility of the performance to take place at all” (95). As such, media archaeology is not a mode of historical research per se, but a way to see “what has remained from the past in the present like archaeological layers, operatively embedded in technologies” (57). This means taking a look under the hood, if you will, of the machines we use everyday, in order to examine “the technoepistemological configurations underlying the discursive surface (literally, the monitors and interfaces) of mass media” (55). In this light, media machines are literally archives of past epistemologies that nevertheless exert agency in the present moment. The archive is not a repository for memory, but an ontological status for media technologies that both record and shape the world in its operation. Ernst’s application of these ideas to digital computers and the internet are particularly compelling, for he situates the archive within cybernetic theory commonly invoked in the digital humanities. He argues that the archival function of digital media is not necessarily in computer storage or the contents of a website, but rather in the source code, algorithm, or protocol. Regarding the hypertextual basis of the world wide web, Ernst writes that “unlike traditional archive repertoires, they are not passive but themselves constitute a logistical document containing links to the pertinent data records – a finding aid in the documents themselves, a self-referential archive” (84). For example, “Ultimate knowledge (the old encyclopedia model) gives way to the principle of permanent rewriting or addition (Wikipedia)” (84). Because the web functions by means of user activity, archives “become cybernetic systems[,]” as “Repositories are no longer final destinations but turn into frequently accessed sites” (99). Ernst concludes, “The real archive of the Internet (in the sense of arché) is its system of technological protocols” (85). It is in this sense that archives are now fluid, constantly in the process of reconfiguration based on the feedback of interactive users. I suspect that much disagreement with Ernst will rest upon how one defines discourse and conceives scientific temporalities. Are his estimations of technology, written in language, non-discursive? Are scientific understandings of “reality,” even though they exist in temporalities that often precede and outlast cultural change by millennia, not themselves subject to discourse, as Thomas Kuhn demonstrated in his analysis of scientific paradigms? Despite these questions, his discussion of digital memory and the archive is important. From where I stand (in California, trained within the Anglo-American framework), I think it best to move away from tiresome transatlantic dichotomies and agree with Ernst that cultural theorists must look under the hood of the internet, accounting for algorithms and protocols on their own terms as technological agents steadily operating apart from the discursive interface, corroborating epistemological schemas, remembering (and forgetting) in ways that underwrite shifting hierarchies of power.